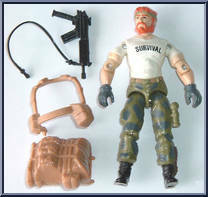 Outback was an instructor at both the Survival School and the Jungle Warfare Training Center. He has had extensive experience in Central America and may or may not have participated in clandestine operations in the Mid East. Most people are intimidated by wilderness and the complete absence of the hand of man. Not Outback. He believes in being part of his environment, not its adversary! Contribute pictures, update details or suggest corrections for Outback. Write a review about Outback.